This is what I ate today on a vegan whole foods, plant-based diet. 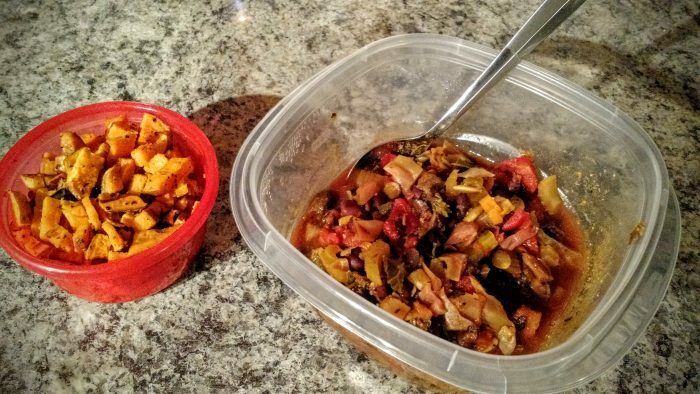 It was a very typical weekday for me, as most of my meals are almost the same from day to day, with the exception of supper, which varies a bit more. My weekends are a little less predictable as well. I’ve included links to some informational videos from nutritionfacts.org to show why I eat (or don’t eat) some of the things that I mention here. As much as I can I try to avoid added salt, sugar, and oils, as well as white flour, processed foods, and of course meat, dairy, and eggs. But more important than what I don’t eat is what I do. Every day I strive to get a wide variety and a large amount of vegetables, fruits, whole grains, legumes, nuts, and seeds. 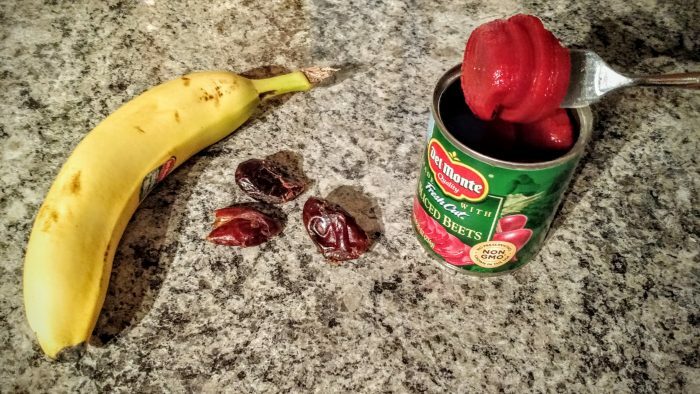 For my pre-workout snack I had part of a can of beets (a pretty incredible food for athletic performance), a banana, and 3 dates. I then went on a 6 mile run. 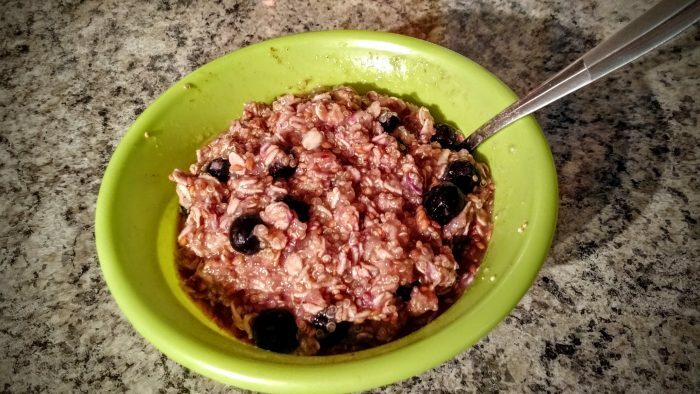 For my post-workout breakfast I had a bowl of quinoa and oats with blueberries, applesauce, flaxseed, and cinnamon. On days when I lift weights I also have a single scoop of plant-based protein powder immediately following my workout. 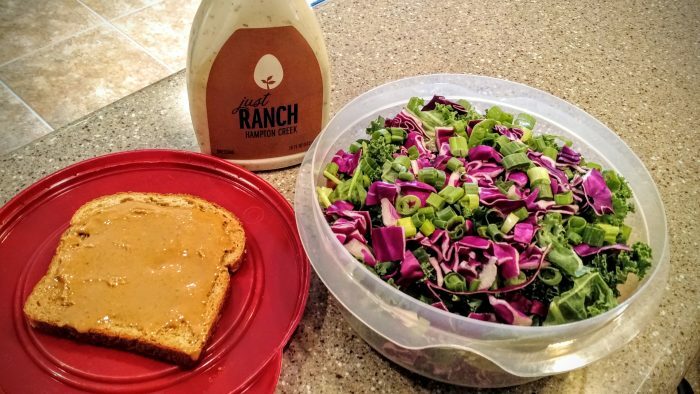 For lunch #1 (I eat more than 3 meals) I brought with me to work a big salad loaded with spinach, kale, pinto beans, purple cabbage, green onions, and mushrooms, with Hampton Creek’s Just Ranch salad dressing. Also a slice of whole grain bread with natural peanut butter and unsweetened green tea, cold steeped overnight. 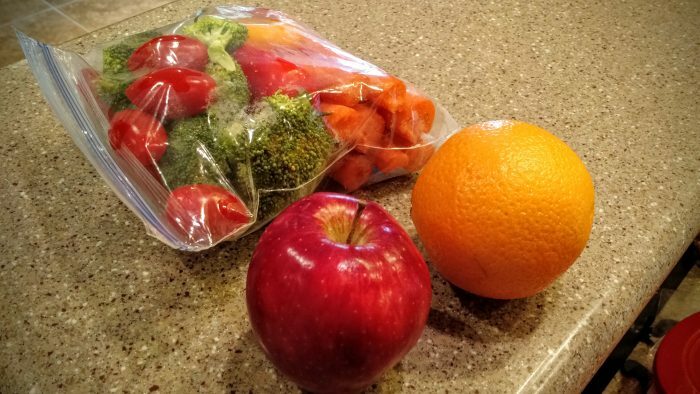 Lunch #2 was a big bag of raw veggies (about 4 whole carrots, a bunch of broccoli, grape tomatoes, and 3 small sweet peppers), an apple, an orange, and a couple Brazil nuts. For supper today I had some leftovers from the weekend, starting with roasted sweet potatoes with a dab of Just Ranch and Mrs. Dash salt-free seasoning blend. Next is a homemade vegetable soup with black beans, diced tomatoes, kale, red cabbage, celery, pumpkin seeds, apple cider vinegar, chili powder, turmeric, and Mrs. Dash seasoning. This was a fairly light dinner for me, and some days I also eat another snack either before or after supper. My total caloric intake for the day was around 1900 calories. My morning run burned off about 730 of those. I logged all my meals with CRON-O-Meter, and you can see my detailed nutritional breakdown below. As you can see, my levels are at or near recommended daily values for almost every nutrient tracked, including protein, all essential amino acids, omega-3 fats, zinc, iron, and calcium. 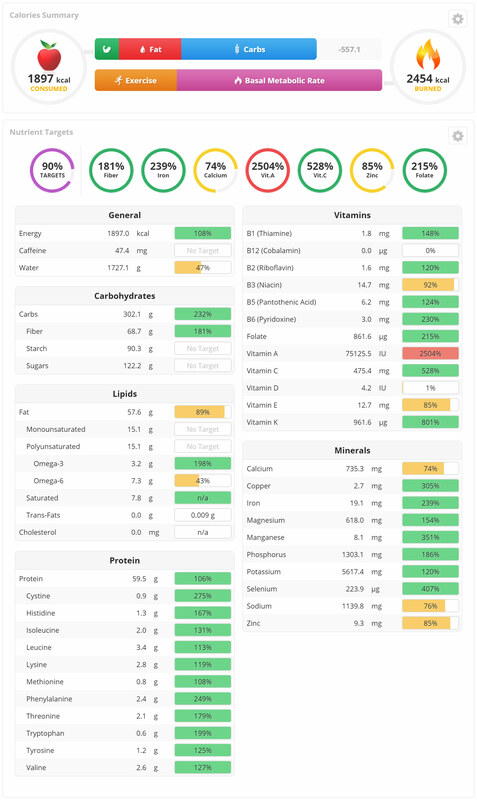 Most vitamins and minerals are off the charts, and this is with no supplements or fortified foods. The only 2 nutrients that are lacking are Vitamins B12 and D, which I do supplement on a regular basis. I would love to hear people’s thoughts. Is there anything missing that I should include in my daily diet (besides meat, for you hilarious comedians)? If you feel that a plant-based diet is dangerous and deficient, I challenge you to log a typical day into cron-o-meter honestly and see how you stack up.